Home > SEP 2018 > India has 3rd highest number of family firms : Report by Credit Suisse. India has 3rd highest number of family firms : Report by Credit Suisse. US and China top list. 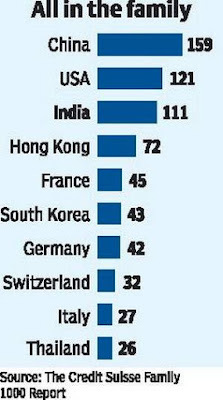 India is home to 111 family-owned businesses. India has the 3rd largest number of family-run businesses in the world after the US and China, according to a report by Credit Suisse. India has 111 family-owned business with a combined market capitalisation of $839 billion. Indian companies owned by families generated average annual returns of 13.9 per cent since 2006, more than double the 6 per cent reported by companies that were not.